There are many places in the ocean where macronutrients (like those that we put in our garden—for example, nitrate and phosphate) are abundant but a paucity of iron regulates phytoplankton growth. Although it has been demonstrated that iron from hydrothermal vents at volcanoes in the deep sea may ultimately reach the surface ocean, it is important to also understand the role of shallow submarine volcanoes in providing iron to the upper ocean. Volcanoes along oceanic arcs above subduction zones, like those in Marianas Trench National Monument, are commonly shallow. 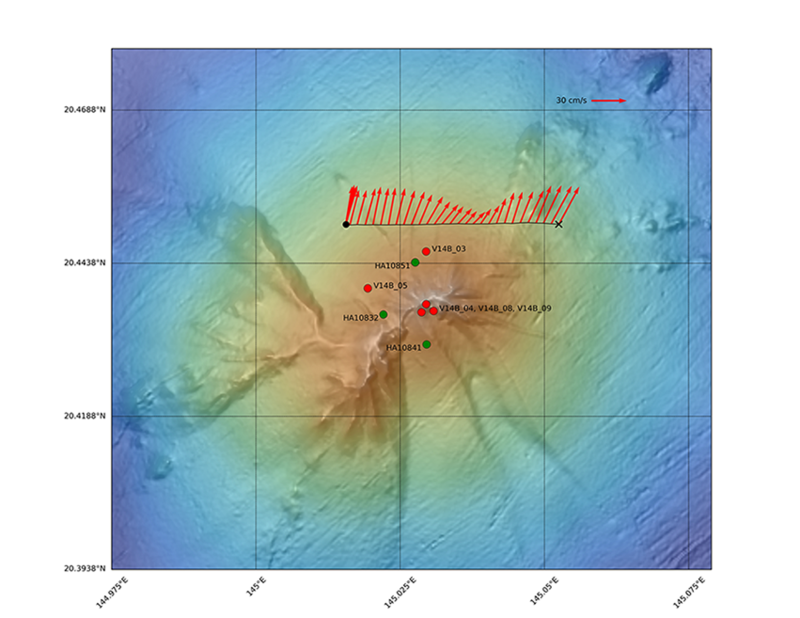 The paper highlighted here focuses on Ahyi submarine volcano, which erupted in April–May 2014 and lies less than 100 meters below the surface of the ocean. In this study, EOI scientists made the first-ever measurements of the flux of iron and other chemicals from a shallow submarine arc volcano. They found that iron and helium-3 fluxes from Ahyi were similar to those from deep-ocean volcanoes along mid-ocean ridges, and the fluxes of methane and manganese were much lower. This is significant because the iron from Ahyi is deposited directly into the surface ocean whereas only a small percentage of that from deeper sites ever reaches the surface ocean, where it might enhance oceanic productivity. For more information or to read the full article, visit the journal's article page (Wiley/AGU).